Quality of Life: Infertility reduces quality of life, especially through negative psychosocial consequences. These range from fear and depression to stigmatization and lost dignity in death. The negative consequences of childlessness are more frequent and more severe in developing countries. Burden of Disease: Globally an estimated 9% of women of reproductive age suffer from infertility. This equates to approximately 80 Million women and equivalent number of men..
Value of Children: Children are highly valued in all countries and cultures. They play many important roles in families and communities, especially in developing countries. Political Commitment: Nations around the world have committed to the Millennium Development Goals (MDG). 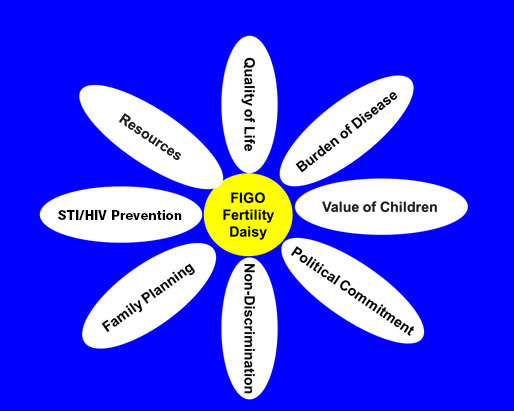 Absence of infertility treatment is a relevant barrier to universal access to reproductive health (MDG 5). Non-discrimination: Children can thrive or suffer in all social classes. The rich are not more deserving of reproduction than the poor. Infertile people are as deserving of health care as those with other diseases. Family Planning: The integration of infertility management into Family Planning/ Reproductive Health/Women’s Health services mutually strengthens these services. STI/HIV Prevention: Infertility is a risk factor for STI/HIV acquisition. Infertility management helps to combat the STI/HIV pandemic. Resources: Many health systems, provided they have the political will, have sufficient resources to offer at least low cost effective infertility interventions. Lack of effective interventions fosters the use of ineffective interventions. Ineffective interventions waste precious resources of health systems and households.